When you accidentally catch an adult sea lion in a fishing net, make sure that you quickly distance yourself from the animal after you've cut the net to set it free. If you don't do this and you are within reach of the animal, you run the risk of being bitten or worse thrashed by the seal. Seals are marine predators. They are known to prey on other seals and otters. They have sharp teeth that can cut through bone and flesh.You want to keep your body intact? Then stay out of biting distance. A fisherman in Russia has learned the hard way the fact that sea lions sometimes attack people and they do so violently. A group of Russian fishermen were trawling on the North Pacific when they accidentally netted a huge sea lion. The animal was probably trying to steal some of the fish caught in the net when it got itself trapped there. The fishermen brought the seal aboard their fishing vessel. Using a knife, one of the men cut a portion of the net to free the sea lion. As soon as the animal got its head off the net, it quickly lounged for one of the fishermen and clamped its powerful jaws on the arm of one of the fishermen. The seal was so powerful it was able to fully lift the man off the deck and throw him to the side. Luckily, the man was wearing a thick and long-sleeved jacket which acted as protection against the seal's sharp teeth. A black dog which was aboard the vessel also tried to scare the sea lion off the ship but the latter didn't budge. It even bit the dog on the shoulder but the dog was able to shrug it off and rightfully scampered away. The fishermen were able to drive the sea lion away using a water hose. As the sea lion quickly retreated to the back of the fishing vessel, the men continued to fire away with the water hose. The sea lion still showed some resistance by facing the water cannon and even tried to get back to the middle of the vessel. The men continued to hose it with water so it eventually backed away. It wasn't shown in the video but reports say that the animal was finally driven off the ship. The sea lion in the video has been identified as a Steller sea lion, a specie that makes the northern Pacific home. Their numbers have significantly declined in recent decades and they are now considered a near-threatened species. Among the several species of seals, they are one of the largest, only inferior in size compared to the walrus and elephant seals. Killing sea lions is strictly prohibited in Russia, Canada, and the United States. 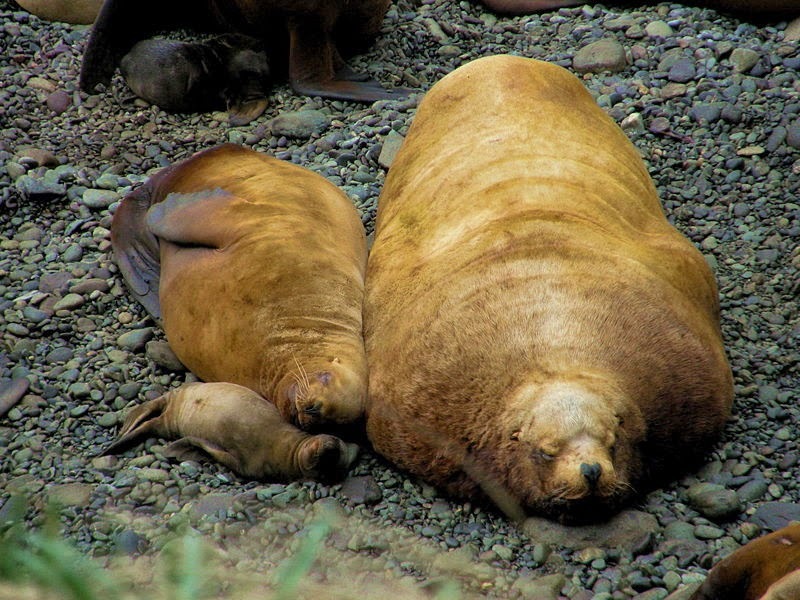 The laws against the killing of sea lions partly arose because some fishermen intentionally kill them because they are looked upon as competitors in catching fish.